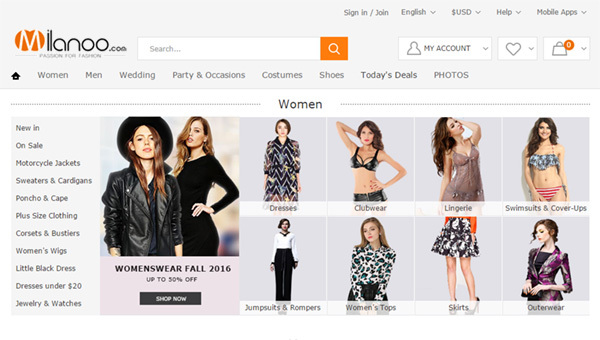 Milanoo is likely to be the most famous and popular Chinese internet-shop that is specialized on realization of different clothing – from wedding dressing to shoes and underline. Established in 2008 in Hong Kong Milanoo Company is known to be one of the favorites among internet shops dealing with clothing realization. The company incessantly tries to take into consideration the needs of all their clients and offer benign items with competitive prices. The shop is also in the pursuit of following all the trends of world fashion. The company is registered in Hong Kong that gives a bit of confidence in the site. All the trade operations are made in the city of Chengdu. Despite the fact that the shop is relatively new it was soon recognized to be a reliable wholesale supplier. The minimum payment in the shop (without delivery) has to be not less than $20. The delivery is paid. If you order on more than $100 and have a special coupon, the delivery is totally free. The shop range is not limited only by women clothing. It also offers a decent variety of items for men and children – suits, shirts, T-shirts etc. You can also find a great deal of baubles and home items on the web-site. Many buyers prefer Milanoo.com due to low prices, high quality clothing, fast delivery, high quality client service and a possibility to return or even exchange the product. Milanoo also has a blog where they give certain advices on purchasing most appropriate items, because you cannot always define if the product on the picture is what you really need, especially when it comes to clothing and shoes.